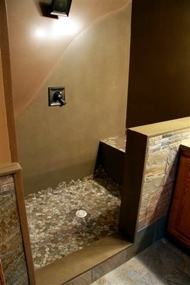 Brad Dykema of Artistic Concrete Expressions in Hamilton, MI, started out in tile. In 2006, he was doing tile projects in high end homes. Wanting to get into more kitchen-related projects, he became aware of concrete countertops and attended World of Concrete. There he met Jeff Girard and was inspired to try concrete countertops. Brad experimented on his own for a while, then decided in April 2007 to get formal training in precast concrete countertops. Having 20 years of experience in high end tile work, he didn’t need artistic training. He recognized the importance of avoiding quality problems like staining and cracking, by learning the structure and theory behind concrete countertop construction. After class, he got started right away, working in his 42′ by 40′ barn. In December 2008, Brad attended the GFRC class, and by July 2009 had expanded his business enough to move into a 4000 square foot shop. The new shop has a room for wet polishing and a room for spraying sealer, making it an ideal workspace for quickly producing high-quality concrete countertops. Brad has carried his vision and passion for quality design and execution to the concrete form of art, and Artistic Concrete Expressions now fulfills that vision in the Grand Rapids and Lansing areas and throughout western Michigan. Artistic Concrete Expressions has grown into a custom concrete fabricator of concrete countertops, furniture, fireplaces, shower bases and shower panels, serving both commercial and residential markets. Brad works closely with designers and homeowners to take their ideas and turn them into a real functional work of art, which not only will be unique but also very personal. As the Artistic Concrete Expressions motto goes, “Your imagination is our only limitation”.